Jack Hanley Gallery presents its first solo show with New York-based, Japanese artist Atsushi Kaga, “I am here with you” with an exhibition of 100+ works in a multitude of mediums including sculpture, acrylic and oil on canvas, mixed media on paper, and video. At first glance the viewer encounters seductively familiar-seeming characters. Painted simply with deft skill, the style of these works falls within the Japanese graphic storytelling tradition of Manga. Visual artifice is one side of a carefully constructed and expertly crafted dichotomy, counterbalanced by content. A closer reading of these scenarios and text in Kaga’s works reveals a humorous, sardonic, and anxious world filled with answerless questions relating broadly to the human condition. While fantastical or even surreal, the vast imaginative vocabulary presents an autobiographical account, or more of an abstracted memoir of the artist’s own deep-seated emotions and memories. Deceptively mundane activities are predominant throughout, although, in accordance with their minimal but skillful stylistic concerns, the compositions pack a sharp punch. The imagined lives and futures of these characters are created from the memory of the artist’s past. Often characters are lost or traveling somewhere which can be equated with the artist’s own loss of Japan in the present tense. 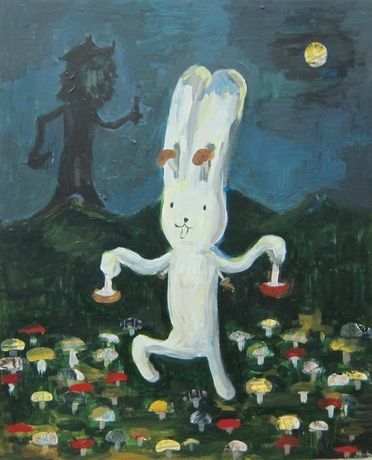 The main character “Usacchi,” or “Bunny,” is a self-portrait of Kaga’s alter ego. Some of the other characters are based on specific people in the artist’s life (his mother the Kangaroo and father the Panda) and others serve as specific symbolic references (an aging Yoda and destitute Darth Vader). Through sculpture, works on paper, and video, and a large cluster of small oil paintings, Kaga presents characters and divulges pieces of the ongoing, although decidedly non-temporal, narratives that he has been developing over the the past decade. Since their stories are not sequential, there is no right or wrong entry point to the works. The format and hanging of these works reinforces this concept, for instance, small paintings are hung in a large cluster on the wall or the large works on paper present densely packed, allover compositions. Meaning changes based on one's knowledge of other works. Although the content is fluid and context is one step removed from the artist's own memory the viewer collects a unique, self-directed understanding or memory of this world, perhaps alluding to the artist's own awareness that while loosely based in reality, his account too is a self-prescribed myth.